Spring can be a frustrating time of the year for chileheads. The garden has not yet produced those chiles and tomatoes you crave for your summer cooking, and the other vegetables are not ripe either. But out there in farming and ranching country, dedicated foodies have grown the spring foods you need to celebrate the season. And we can find the heat sources to spice them up. Here’s my take on what you should be cooking for a spicy spring. Nowadays, greens are available all year long, but for the home gardener, spring is the best time for spring greens before they are burned up by the summer sun. The most common greens are probably various kinds of lettuce and spinach, but there are many other varieties of greens, some with weird names. Chicory, Dutch savoy, bok choi, watercress, sorrel, mustard greens, turnip greens, endive, escarole, radicchio, Swiss chard, golden orach, kale, dandelion, purslane, and amaranth are a few of the lesser known, but tasty greens. Interestingly, chile pepper leaves are also edible and can be used as greens. Available from April to July in the eastern United States, fiddlehead ferns are tightly coiled, bright green and taste like a cross between asparagus and green beans. They are a good source of vitamins A and C, and complement the slightly bitter flavor of some greens. You should make small batches of the dressing because the avocado will discolor slightly on the second day; however, it is so good and so versatile, that it probably won’t last that long anyway. Using Champagne vinegar adds zest without the harshness associated with other types of vinegars. You can also serve the dressing over cooked chilled vegetables, such as freshly cooked asparagus or artichokes. Place all of the ingredients (except the greens and ferns) in a blender or food processor and blend until thoroughly mixed. If the dressing seems too thick, add more water or yogurt. 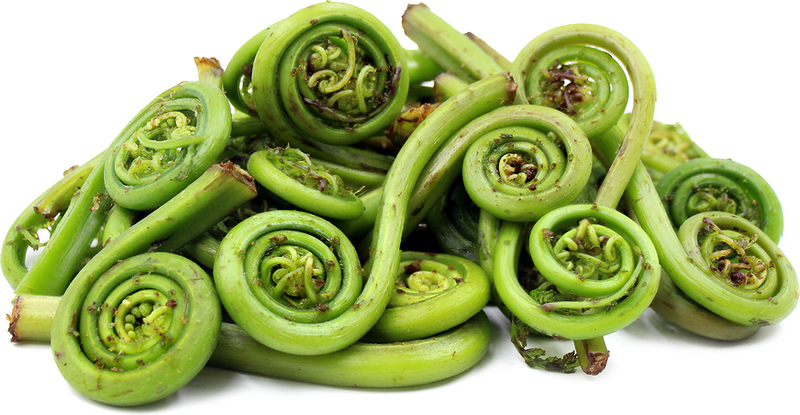 Place the mixed greens in 6 bowls and add 3 fiddlehead ferns to each bowl.. Add the dressing to taste. 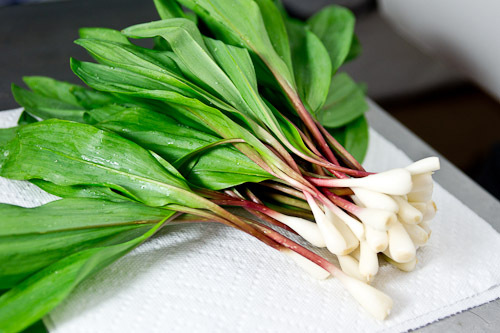 Ramps are wild onions with a strong garlic aroma and flavor that are very popular in Appalachia, where festivals are devoted to them. But many people think that they are much too strong and there is even an aphorism that goes: “Ramps are not for ladies or those who court them.” Ramps are not cultivated but are collected in the wild. 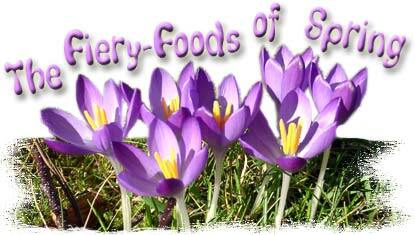 Sometimes they can be found at farmers’ markets from southern Canada to the Carolinas beginning in April. They were a favorite of forager Euell Gibbons, author of Stalking the Wild Asparagus who loved them to pickle them and use them in soups such as this one. If you can’t find ramps, substitute scallions with a few cloves of garlic. Of course, you can adjust the heat level by increasing or reducing the amount of chile powder added to the soup. Serve with crusty French bread. Melt the butter in a 6-quart stock pot over medium-high heat. Add the ramps and stir. Season with salt, black pepper, and chile powder. Saute until the ramps are wilted and soft, about 6 minutes. Add the bay leaf and garlic, stirring for 2 minutes. Add the stock and potatoes and bring the mixture to a boil.Reduce the heat to medium and simmer, uncovered, until the potatoes are very soft and the mixture is thick and creamy, about 1 hour. Remove the soup from the heat. Discard the bay leaf. Slowly add the cream. Stir to blend. It can be served as is, or blended in a blender or food processor. The odd-looking morel does not have a cap but rather a fruit body about four inches long that is pittted and resembles a honeycomb. Since the darker the mushroom, the stronger the flavor, the morel is prized as one of the strongest mushrooms with its earthy and smoky flavor. It is related to truffles, but far more common. They are spring mushrooms, available fresh from April through June, although specialty markets will have them all year long in the dried form. They are easily rehydrated. Morels are particularly common in the midwest, and a festival is devoted to them in Boyne, Michigan. 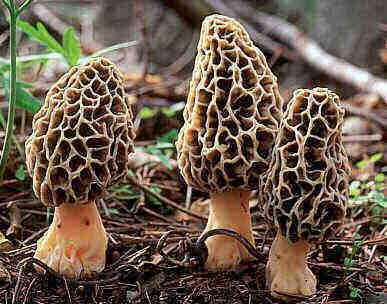 Since morels have never been successfully cultivated, mushroom lovers depend upon foragers. A word of caution: never eat morels raw, as they contain toxic helvellic acid, which is destroyed by cooking. This sauce does wonders for any roasted meat, including beef, pork, lamb, elk, and venison. It is also terrific on roasted chicken or turkey. In a small heavy saucepan, boil the water with the sugar, without stirring, until a golden caramel color results. Remove the pan from the heat and carefully add the vinegar and balsamic vinegar down the side of the pan. Stir the mixture over moderate heat until the caramel is dissolved, about 3 minutes. Remove the pan from the heat. In a heavy saucepan cook the morels in butter, stirring, over moderate heat until liquid from morels is evaporated, about 5 minutes. Transfer the morels with a slotted spoon to a bowl and reserve. Add the shallots and the cayenne to the pan and cook, stirring, until golden. Stir in the wine and boil until reduced to about 1 cup, about 15 minutes. Add the stock and reserved morel soaking liquid (if using dried morels) and reduce to about 1 1/4 cups, about 15 minutes. Remove the pan from heat and stir in caramel mixture. Add the morels to sauce with salt and pepper to taste. You can serve the sauce as is or processed in a blender or food processor. 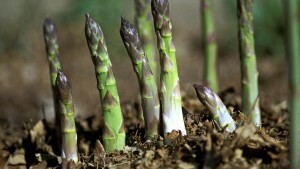 Asparagus is probably the most revered spring vegetable. I recall that when I lived in Los Chavez, between Belen and Los Lunas in New Mexico, the wild asparagus would sprout beneath the cottonwood trees and I could collect as much of it as I wanted. This was before the Internet, so I was constantly combing through cookbooks to find new recipes for this unusual, leafless plant with the odd name. Interestingly, the word asparagus comes from the ancient Persian word asparag, meaning a sprout. Asparagus is a nutritional gem. It has only 22 calories per half cup or approximately six spears and contains vitamins A and C plus 2 grams of fiber. Snap off tough ends of the asparagus. Remove the scales from the stalks with a knife or vegetable peeler. Cut the spears into 2 inch pieces. Coat a large nonstick skillet with cooking spray. Place over medium low heat until hot. Add asparagus, soy sauce, sesame seeds, ginger root, serrano, and pepper. Cook, stirring constantly for 5 minutes. Serve immediately. And new potatoes are not really all that new. They were cultivated in Peru by at least 3000 B.C. and had many different shapes and colors. The Incas development the technique of freeze-drying the potatoes so that they could be safely stored. Now here’s a delicious spring vegetarian dish that utilizes new potatoes, and feel free to increase their number and reduce the eggplant if you so desire. Preheat the oven to 375 degrees. Place the eggplant in a colander. 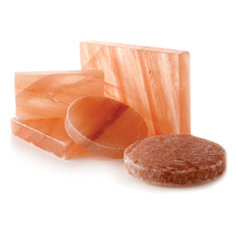 Toss with salt and set aside for 1 hour to remove moisture. Pat dry with paper towels. In a large skillet, heat the olive oil. Saute the celery, leeks, onions, and garlic. Carefully remove the sauted vegetables, leaving the oil in the skillet. Place the vegetables in a large oven-proof casserole dish. Saute the potatoes in the skillet for about 5 minutes, then add to the casserole. Next, increase the heat and stir-fry the red and green bell peppers and zucchini in the skillet for about 5 minutes. Add this to casserole with the tomatoes, broth, cilantro, 3 tablespoons sesame oil, and the chile powder. Stir gently and bake for 30 minutes, uncovered. Wipe out the skillet and add the 1/3 cup sesame seed oil. Over medium heat, saute the eggplant until tender. 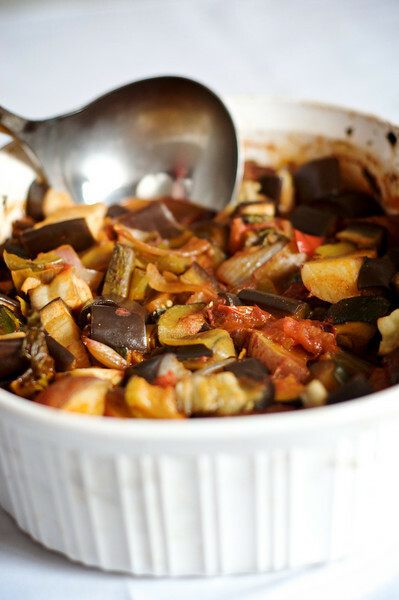 Stir the eggplant into the casserole and bake, covered, for 30 more minutes. Fish that live in both fresh and salt water–and migrate to spawn-are called anadromous. They include salmon, eels, and shad. When I lived in Richmond, Virginia, spring was particularly enjoyable because of the shad runs up the James River. It was fun to go down the fast-moving river and try to catch the shad on light spinning tackle. We would use shad jigs, which are molded metal with a feather and a hook. Since shad have very tender mouths, it was quite a challenge to hook and land them. Once I caught a four or five pound female, but it took me a half-hour to land it. We would throw the thinner males back in the river, but keep the females for their roe, or eggs. Because of their many bones, shad are not very good to eat except for the boneless roe. The prevailing joke was about planked shad. Before an open campfire, butterfly the shad and tack it down on a plank. 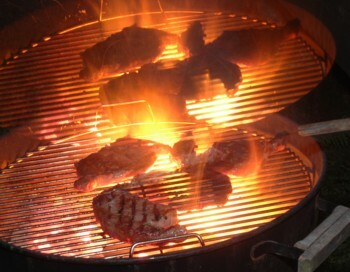 Place the plank near the fire and cook for ½ hour. Then throw away the shad and eat the plank. You can actually use any fish roe in this recipe, so ask your local fishmonger what is available. If you’re in Richmond in April, you’ll find this breakfast shad recipe in restaurants. Of course, you won’t find the green chile eggs, as we do that here in New Mexico. This recipe will not win any awards from the Food Police. In a skillet, combine the shad roes and the bacon drippings and fry the roes for about 10 minutes, turning several times. When the roes are half-done, in another skillet melt the butter, add the eggs and scramble with a fork. When the eggs are nearly done, add the green chile and cheese. To serve, sprinkle the roes with your favorite hot sauce and place next to the eggs. 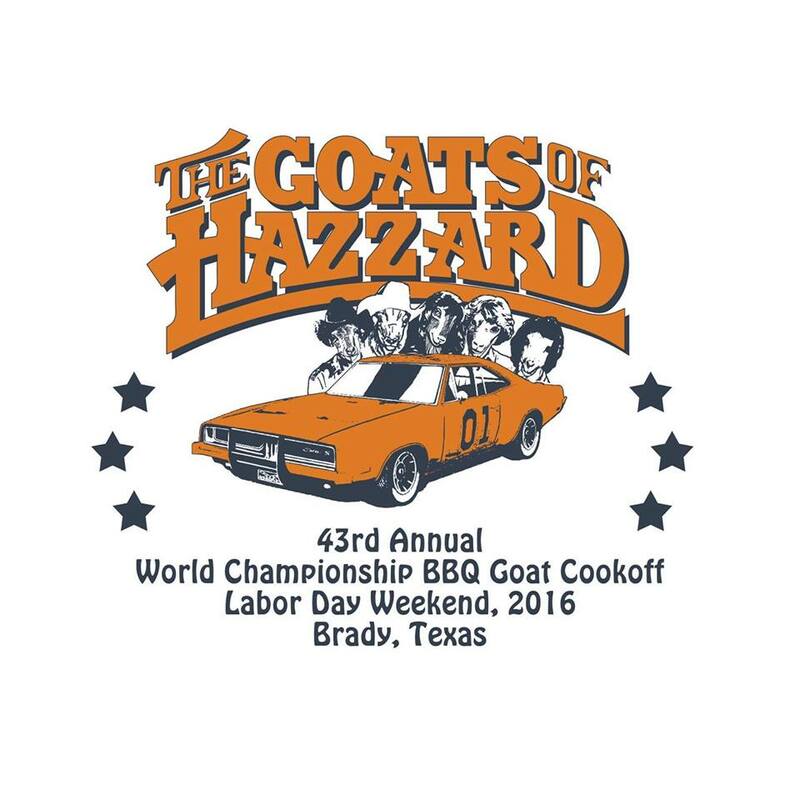 The central Texas town of Brady has staged the World Championship BBQ Goat Cook-off for more than forty years on Labor Day weekend. And they know how to cook it correctly, using ten to eighteen pound goats that have been slaughtered at thirty to forty days of age. The older goats eat grass and develop a distinct muttony flavor. They can also be tough. The best time to find young goat is around May. Cabrito is the Spanish word for young goat. Purists insist that the only traditional way to cook cabrito is to dig a hole in your back yard and burn mesquite wood down to coals. Then you take the skinned cabrito, season it, wrap it in wet burlap bound with wire, and set the meat over the coals. You cover it with dirt to seal in the heat and smoke, and let it cook all day. Known in the Southwest as cabrito al pastor, barbecued young goat is a spring tradition that can be duplicated in a grill with a spit or in a smoker. The biggest problem is going to be finding a young, tender 12 to 15 pound young goat and you may have to search out butchers, farmers, or Hispanic markets. You can also substitute a large leg of lamb if you can’t find the young goat, and adjust the smoking time downward. Sprinkle the rub all over the goat and rub it in thoroughly. If grilling the goat, build a mesquite wood fire in a large barbecue with a spit, or use natural charcoal and mesquite chips. Arrange the goat on a spit about 1 foot above the coals. You can use a motor to turn the spit, or turn it manually every 10 or 15 minutes. Cook until the internal temperature reaches 170 degrees F., for well done. If smoking the goat, place the goat on a rack in the smoker with the smoke from pecan, oak, or fruitwood at 200 to 220 degrees F. Smoke for about 1 hour per pound, or until the internal temperature reaches 180 degrees F.
To serve, slice the cabrito thinly and top with barbecue sauce. Serve with the tortillas, guacamole, and salsa on the side, or make tacos topped with the salsa. Ninety percent of Americans eat strawberries, according to the California Strawberry Advisory Board, and we eat about 3.4 pounds of fresh berries and another 1.8 pounds of frozen ones. California grows about 75 percent of all strawberries and the peak season is March through May. Eight medium strawberries have only 50 calories but supply 140 percent of the daily requirement of vitamin C. They also taste great! This is a shocking dessert if there ever was one, with the sharp flavors of the pepper tequila and black pepper strangely complementing the sweetness of the strawberries. Only a truly daring chilehead would serve this over chile-infused icecream. Combine the strawberries, orange juice, tequila, black pepper, and balsamic vinegar in a bowl and toss well. Cover and chill for 3 hours, stirring occasionally. Spoon the mixture into 6 small glass bowls and garnish with the mint sprigs.